I was born in India and spent the early years of my childhood in the West Indies. I had a carefree childhood with space and freedom to explore, with no technology or modern amenities and very few play mates within easy reach. So using my imagination to invent games and imaginary characters was a natural part of growing up. I was brought up in a family that were good with their hands, had a sense of beauty and an appreciation of things that were well-made. Practical skills, working with what was available and handling materials were encouraged and continue to be important in my practice. Being resourceful and using what was available were necessary and I now realise were a wonderful basis for nurturing creativity. I enjoy the industrious process of creating work and investigating materials and ways of working. Much of the joy in what I create is in the actual making process; allowing work to change through construction, finding visual, inventive and expressive ways of capturing fleeting moments. Combining fabric and paper, stitched surfaces and unexpected materials is exciting. It allows connections to emerge, so using mixed media is important to my way of working. I continue to search for ways to express the essence of a place, a moment, or people that have had an impact on my life, inviting viewers to respond in their own way. I have recently become absorbed by the widespread love of collecting, not so much of precious objects, but rather, of items of no intrinsic value, that have significance for the collector. For many years I have collected and kept such items and my current work is an extension of that process: finding, sorting, remembering, ordering and presenting. The collections mark moments in my life, map where I have been, and continue to fire my imagination. I feel passionately that our own craft and textile heritage, as well as those of other cultures, should be celebrated and passed on to future generations. This aspect of my work is enriched by repeated study of my own, more organised collection of Southern African and Indian textiles and artefacts. Going back to the familiar and seeing again with new eyes, the innovation, use of materials and construction skills, refresh my own way of working. Originally trained as a teacher, I have been able to combine that experience with my passion for fabric and thread. I loved my years of teaching creative textile courses as well as acting as an External Verifier for City & Guilds qualifications. Now, I am enjoying the freedom of spending more time developing my own personal work. I continue to be excited by opportunities to tutor, mentor, share experiences and develop ideas with others who want to extend their practice. I also find it very rewarding working with, and supporting, those involved in the care and preservation of ecclesiastical textiles in my advisory textile role to the Lincoln Diocese and Coventry Cathedral. 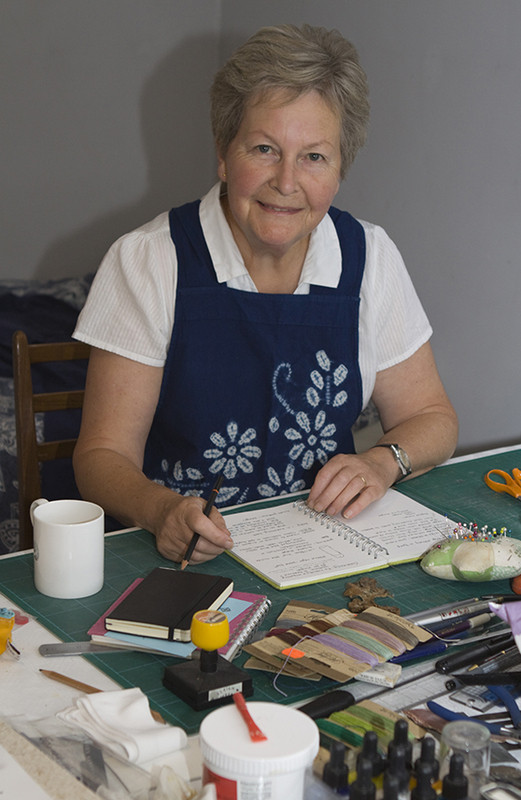 I am a full member of The Embroiderers’ Guild as well as an active member of The Textile Study Group, exhibiting and teaching throughout the UK and abroad. The TSG is a diverse group of qualified, nationally and internationally known artists and tutors. They have established a reputation for excellence since its inception 40 years ago. If you wish to contact me, please use the form under Contact Me in the menu on the left.